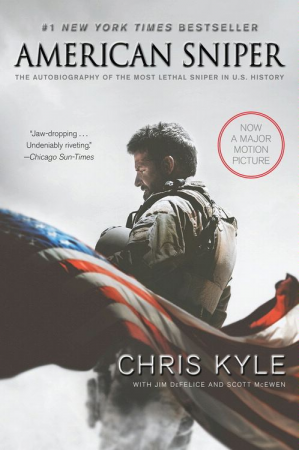 American Sniper is the story of the Navy SEAL Chris Kyle and his many deployments during the War on Terror. For a complete summary, you can go here. This is not my kind of book. I am ignorant about the military and the inner workings of war. Long action and fight sequences are boring to me — but I have to give this book the credit it deserves. It is extremely well written and a compelling story. I actually saw this movie earlier this year, and it was one of the few war movies that I really enjoyed. My husband and I listened to this book together on a road trip for the holidays and he loved this book. He appreciated all the details in this book and was completely enthralled. I spaced out a few times [ehem—fell asleep a few times], but I still listened to enough of the story to understand the basics. It’s very long book and very detailed, so prepare yourself for that. Some of it also starts to feel repetitive. I’m glad that he included his trainings and the times between deployments, not just the actual war. For the first time, I am glad that I listened to this rather than read this, because it probably would have taken me forever to get through if I was reading it on my own. In audiobooks, sometimes the way a book is written doesn’t sound as nice when it is read aloud. This book was made for an audiobook. It sounded very natural and I felt like I was listening to a war veteran tell stories, rather than read a book. I appreciated that the book also gave the wife’s perspective, but those parts were also read by the same man, so sometimes I would forget when it was supposed to be her speaking [his female voice was just his normal voice at twice the speed]. I have some issues with some of the things he said/did throughout the book, but I will keep my opinion of those things to myself. I am glad he told his story and I feel like I know a little bit more about the military world now [though I still claim ignorance]. RIP Chris Kyle. If you are interested in buying the book, you can buy it here. After you have read it, leave a comment and let me know what you think!